Known for her unique aesthetic of juxtaposing refined elegance with modern whimsy with her eponymous fashion line, designer Lela Rose just added another line in her already impressive résumé – the ultimate host! 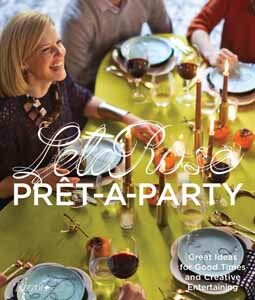 In her new book, Pret-a-Party: Great Ideas for Good Times and Creative Entertaining , Lela tells all as she presents nine perfectly curated parties, dinners, picnics and more. From a spirited Couples’ Cook-off to a kid-friendly “Primp Your Ride” bike picnic, to an elegant White Christmas dinner, Lela presents a fresh take on the average fête. Call it the new bible of entertaining! Pret-a-Party: Great Ideas for Good Times and Creative Entertaining will surely become a pillar for entertainers and party throwers alike. Thinking far beyond the hors-d’oeuvres, cocktails, and ambiance, Lela invites readers to see how simple it is to create an imaginative and unforgettable event. Pret-a-Party: Great Ideas for Good Times and Creative Entertaining will be in bookstores beginning September 29, 2015.